Trimming a pet’s nails can be quite a challenge as it’s not a particularly enjoyable event for anyone. But there are ways to make it easier on your pet and you. You can make the job of cutting your cat’s nails easier by gently handling paws regularly. You’ll need a clipper made for cats and a styptic pen or powder in case of bleeding. Gently pressing the nail bed forces the nail to extend. Hold the cat gently, but firmly. The pink area inside the nail is called the quick where there are blood vessels and nerves. Hold the clipper so that the nail is cut from bottom to top. This will prevent the nail from splitting. Cut halfway between the tip and the quick. If your cat struggles, stop and try again later when s/he is calm. If the quick is cut, dab the styptic pen or powder on the area. If you don’t have the pen, a dab of flour, cornstarch or cornflower will work. But remember when clipping less is better. Check the back claws. They usually don’t need clipping as cats often chew them and do the job themselves. Clipping can be done every 2-3 weeks. If you are unable to clip your cat’s nails, have a groomer or your vet do it. Some dogs can put up quite a fuss at the sight of the nail clipper. 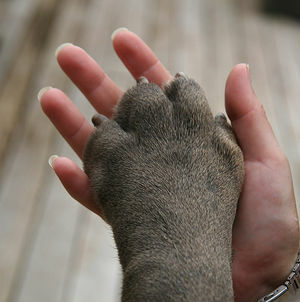 It’s very helpful to get your dog used to having his/her paws touched. Gently handle and massage the paws and nails regularly to accustom your dog to the touch. Offering a treat afterwords helps associate the experience with something pleasurable. Depending on how often you walk your dog and whether the surfaces are hard or not will determine how often the nails need to be trimmed. There are a variety of nail clippers to choose from, just pick one that you and your dog are most comfortable with. Read directions for use carefully or have someone experienced show you how it’s done. For the procedure, you can sit on the floor with your dog or place him/her on a table. If you have someone to help you with holding the dog, so much the better. A dog’s nails have a hard outer covering protecting the quick – the inner soft part containing nerve endings and blood vessels. You can easily see the pink color of the quick in light colored nails. With dark nails, it’s best to clip them gradually, taking a small piece each time. When you see a pale circle, that’s the quick. At that point, you’ve trimmed enough and it’s time to stop. Clipping even a little of the nail is helpful. Accidents sometimes happen and if you find you’ve cut too deeply, it will bleed. 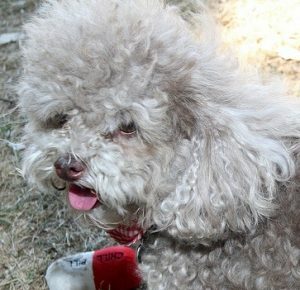 It’s a good idea to purchase a styptic pen or powder beforehand and keep close by when trimming your dog’s nails. If you don’t have a styptic pen, use flour, cornstarch or cornflour and put a small amount on the area of the bleed. If you can’t stop the bleeding within a few minutes, contact your vet. If you prefer, you can have a groomer or your vet clip your dog’s nails. Clipping a bird’s nails helps prevent foot problems and makes it less likely your bird will scratch you or the furniture. Use a clipper made especially for birds. Wrap a large towel carefully around your bird in order to reduce stress. This is a 2 person job, so one of you will hold your index finger and thumb of one hand around the bird’s neck, just below the beak to prevent biting. Place your other hand just above the legs being careful to allow the bird to breathe and not to squeeze. Very gently, extend each claw, taking a small portion of the claw. Avoid too much pressure as delicate limbs can be easily broken. If there is bleeding, dip your finger in some flour and pack lightly. Call your vet if bleeding doesn’t stop as birds can die quickly from blood loss. 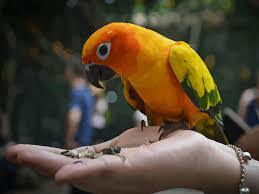 Your bird will probably be stressed after the experience, so return him/her to the cage and offer a treat. There are several battery-operated pet nail trimmers now on the market for use with both cats and dogs. 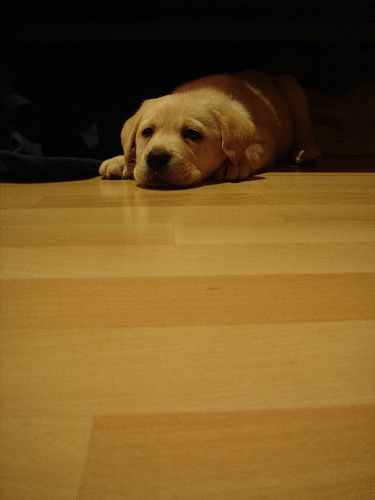 They usually work quietly as too much noise can upset your pet. Read and follow directions carefully before using. Again, if trimming your pet’s nails is not a chore you feel you can handle, ask your vet or have a groomer do it for you.